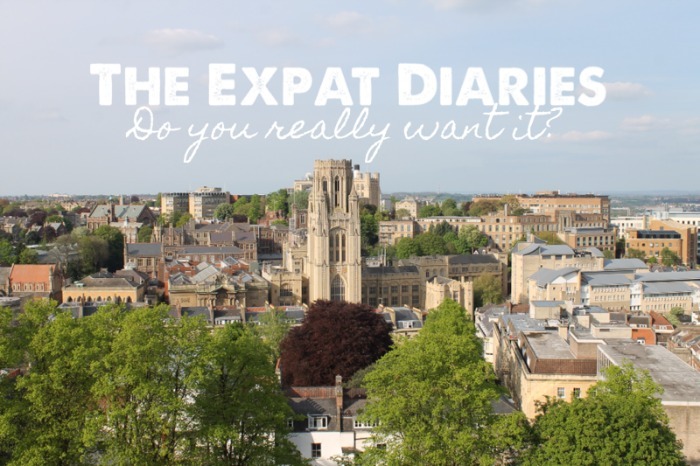 The Expat Diaries: Do you really want it? I've had such a beautiful response to last week's Expat Diaries post - thank you for commenting and sharing it. It seems that so many of us were born with gypsy hearts and I loved reading about all of the far-off places you dream of visiting and the wild directions your hearts are pulling you in. I recently had a conversation with a friend who congratulated me on "living the dream" and told me that he dreams of living abroad "someday." He asked how I did it and I excitedly prattled on about how I'd gotten here, how wonderful it's been, and encouraged him to get started on making it happen. Why wait for someday, when you can start chasing your dream right away? It turned out he had a million reasons. His family would be upset. He's comfortable at his job. He has a five-year plan that requires staying where he is. He plans to buy a house, etc. etc. In other words, he likes the idea of moving abroad, but he doesn't really want it. It's not his dream. At least not right now. The thing about leaving things for "someday" is that we get comfortable, inertia sets in, and the reasons to stay where we are keep piling up. But just because you haven't plunged headfirst into a crazy dream yet, doesn't mean you're not the kind of person who can. But in the last couple of years I've become braver and bolder. And the more risks I've taken, the more I've followed my heart and my dreams, the more the world's opened up and even bigger, crazier dreams now seem possible. Even if you're not at a place in your life where becoming an expat seems possible, I'm here to tell you that it is. And the more steps you take towards making the move, the more you'll see that. So, sit down today and take a step towards making it happen. Tomorrow take another and the next day another. Once you get the ball rolling your dream becomes something you're doing, rather than just something you're thinking about. Create a Pinterest board and start collecting images of the places you dream of. Tell your friends or your partner that this is your dream and you're starting to create a plan to make it happen. Write down a list of all of the obstacles you see standing in your way and then brainstorm creative solutions to overcome them. And be honest with yourself: are they genuine obstacles or are they excuses you're creating out of fear? Research the visa requirements for working in the country you want to move to. Find out the cost of living and create a budget for your move and three months' expenses. How much money would you need to put aside each week to save that much in a year? Brainstorm 100 ways that you can cut back your expenses and earn more money. Pledge to put all of it into a dedicated fund. Send me an e-mail and ask me any burning questions you have about being an expat and what it took for me to get here. Of course it's completely okay to be like my friend and have other dreams that are more important than moving abroad. All dreams require sacrifice and that means letting go of goals that are incompatible, so that you can focus on what's really important to you. But decide not to move across the world because it's not your dream, because other yearnings are calling out to you more urgently and convincingly. But don't decide to stay where you are because you think you have to or that you're not the kind of person who takes a leap or because it just isn't possible to do anything else. So, if you want it, make it happen! I'd love to hear what step you're going to take today. And on those days where you're filled with resistance and feel certain that this dream will never happen for you, get in touch. I'll be your cheerleader. Older PostThe Expat Diaries: But where will you go?